Mr. Hill attended a local art class where he learned the old master’s oil technique of underpainting and glazing. His mentor was the accomplished painter James Cole Young, an art professor at St. Bonaventure University. Paul Hill received his B.A. in painting from State University of New York at Binghamton and his M.F.A in painting from Edinboro State University of Pennsylvania in 1991. In 1994 Hill moved to Atlanta, Georgia where he met his wife Jennifer. Paul Hill’s works have been included in many local, national, juried, and independent exhibitions. 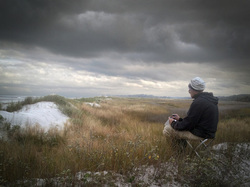 He has been involved with several galleries and independent projects. He regularly donates work to many charitable organizations for auction. For the past several years, Hill has been working on a large-scale series of paintings exploring the natural wonders of Georgia. He currently resides in Atlanta with his wife and three children. Painting directly from the landscape gives me the opportunity to learn new rhythms, patterns, movements and generate fresh, spontaneous color combinations. This is my way to develop a visual fluency in the language of landscape. Nature can be fast. My hand tries to keep up. Sometimes I get lucky and connect with a sort of shorthand to capture these fleeting moments, these places, and these eras. I am an oil painter. I have designed, built, tested, and refined much of the equipment I use in the field. I am well versed in the ways and techniques of the 19th century American landscape painters. This direct method of oil painting from nature is the means by which much of my recent work in considered finished. When I am inventing a landscape, I always develop a sense of place. Residing in every physical place, including wilderness, lives an immaterial space that tells us about a way of life. I like to think I am painting an intelligent landscape. If I can include what collective knowledge of the cosmos and concerns for spirituality we have, such as local colors, hidden ideas or history, I will make, at the very least, some enjoyable and entertaining landscape paintings. Being invited and participating in the Visiting Artist Program on Ossabaw Island is a great opportunity to aid, first hand, in preserving this great unspoiled, beautiful place. This is continuing education at its highest level. Every artist who comes here to work and explore contributes, whether knowingly or unknowingly, to strengthening the Ossabaw Island Foundation’s promise to Ms. West’s courageous vision for the Island. It is a remarkable and rare experience.